This year I received an amazing Christmas gift – my words were actually quoted in a print book! 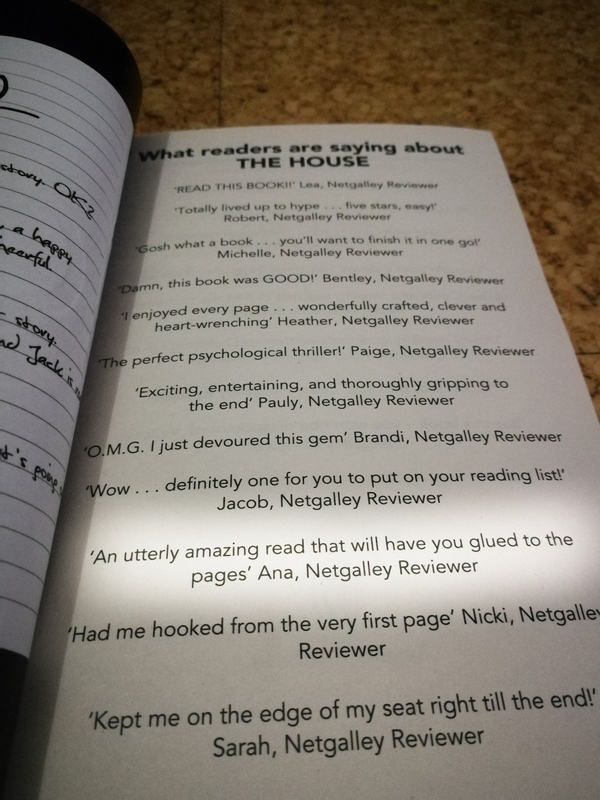 The publisher wrote to me asking to use a quote from my review and I was more than happy to give them the go ahead. Even though I live in Portugal, they actually offered to ship a copy to me, which I have to admit I was thrilled to receive. 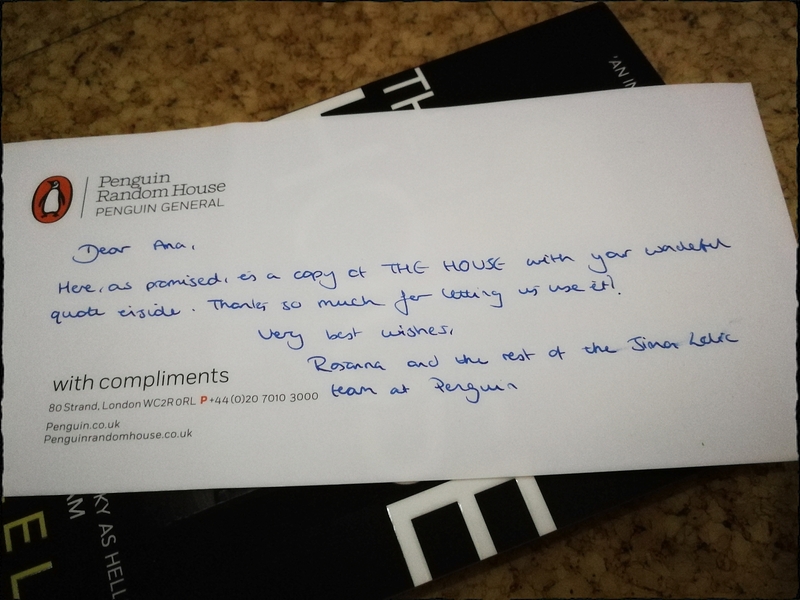 Also, it’s Penguin, you guys! I have to say I am ecstatic. 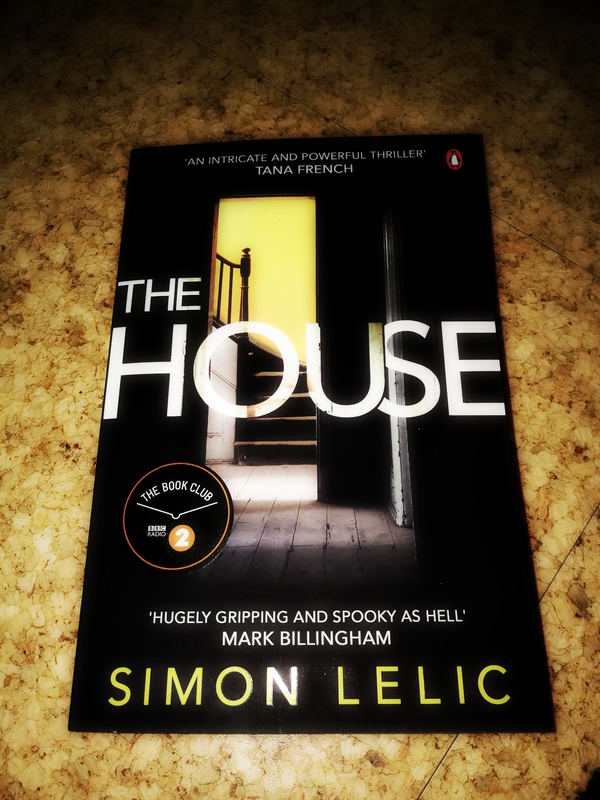 The book is The House, by Simon Lelic. 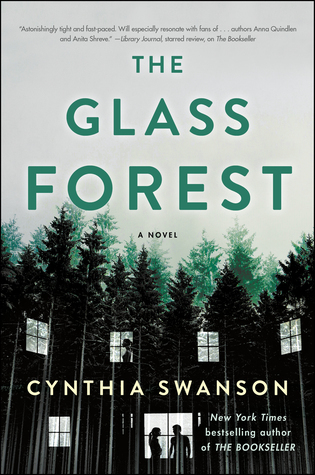 I really enjoyed reading this psychological thriller. The writing style was quite unique, as both main characters would take turns writing in the form of a journal that served as a tool to cope with what had happened. 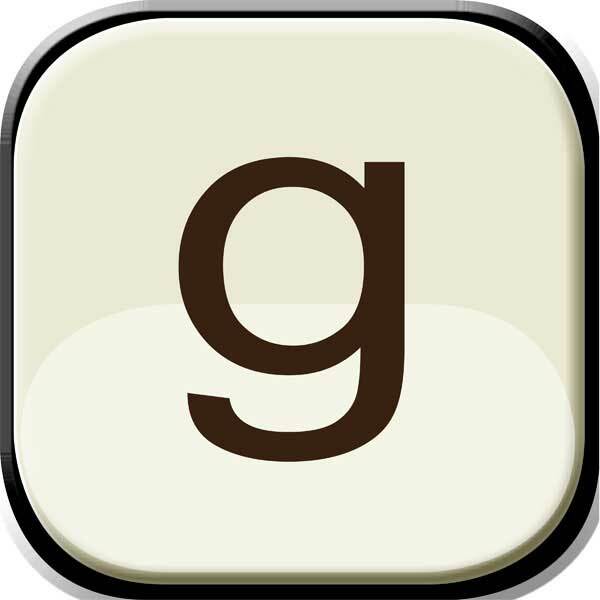 The characters were extremely well-developed and the story was enthralling. I do recommend it among others of the same genre. It is quite anonymous but I am still extremely happy with it. Has anything of the sort happened to you? Tell me everything! Tom and his wife live on an almost deserted island, where Tom is the lighthouse’s keeper. In one April morning, the arrival of a dinghy will force them to make a decision that will change their, and others’, lives forever. 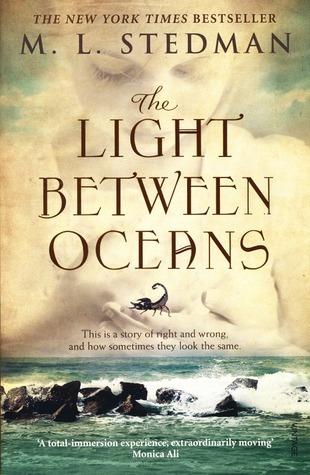 The Light Between Oceans took me forever to finish because it was a challenge to myself, not something I would normally read. I suppose I am used to more fast paced books so I didn’t find myself looking forward to knowing what came next, more looking forward to seeing what these characters would do with what was dealt to them. It is most definitely a character driven book, and I have to admit they conquered my heart, particularly Tom. A man with a past that haunts him every step of the way but who always tries to do the right thing. Still, even the more secondary characters had a voice, and their own way of thinking, and their own desires, and I felt compelled by them as well. Towards the last part of the book, the story takes some twists and turns, and it took my heart along with them. I honestly could not say ‘this is the right thing to do’. I could only suffer alongside with them an hope for good closure, which I got, all things considered. There isn’t much I can tell you without spoiling the story. It’s one of those that are best savoured if you go into it knowing the least possible, so you can also better understand the characters’ motivations. It will particularly touch you if you are a parent. Just be warned that it broaches extremely difficult subjects, and that sometimes it is nearly impossible to do the right thing, or even tell what it is. This is an extremely well crafted book and I highly recommend it. I think it’s about time I posted something explaining my silence. You may have noticed I did not post a November wrap-up post, which was a first. The fact is I didn’t finish any books that month, nor wrote any reviews on films or other stuff, so I felt it would be rather pointless. Also, a few months ago, namely in May, I decided to turn my life around. I constantly felt ummotivated, tired, with little or no energy to do anything or take care of myself. An opportunity came up to join a gym downstairs from my workplace and I figured, why not. I started going after work and at the same time improving my food habits, and I did start feeling better. However, I started going less and less and still eating poorly so quickly slipped back to the same routines. A co-worker mentioned he went to the gym before work and I thought wow this guy is nuts. Then I started thinking, hmm, ever since I met him I have never once seen him tired or in a bad mood… I wonder if this is his secret. Well, when daylight savings time came, I decided to give it a try. Technically I would still be waking up at the same time, my day would just be an hour longer. Minus some days I took off work, I have since then been working out before work, waking up at 5h50 am, and I have to tell you, I really hope I can keep up the pace because I feel TONS better. More energy, better mood, I walk taller, better posture so less back pain… Not to mention I avoid morning traffic, trouble finding a parking space, crammed tube… I am still not able to catch a seat so reading time is again caught short but I usually manage only a couple of pages on tube rides and lunch breaks so yeah, it’s taking ages to finish the book I started last month. After work I always have errands to run so by the time I get home I am really exhausted. I only really have the energy to play Sims on my phone and browse Wish and AliExpress – my two new things. So I am really, really sorry about my silence. I am looking forward to fitting reading and reviewing back into my routine as soon as I am able to get another Kindle – that might take another month, though. I hope all is well with you, and thank you so much for your continuous support of Ana’s Lair.